HOME PRODUCTS &AMP; SERVICES DIRECTORY OF SUPPLIERS OX CREEK ENERGY ASSOCIATES, INC.
Corona cameras for detecting corona or arcing during daylight or lowlight are sold, rented, or leased in North America by Specialized Camera Sales division of Ox Creek Energy Assoc Inc. a Service Disabled Veteran-Owned Business (SDVOB) which imports, distributes, sales, and service for specialized cameras including infrared, visible, and ultraviolet for lowlight, laboratory, and solar-blind daylight corona inspection. 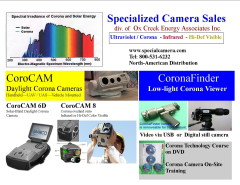 Corona Camera sales, rentals, leasing, corona camera training, corona training are all available at Specialized Camera Sales with 46 years of corona inspection experience. The critical voltage of corona inception is dependent on many factors, learn more in the Corona Technology Course. Partial Discharge is a form of corona, a material can have an internal flaw or bubble with discharges which distort the electric field in the air above the defect and if the electrical field is intense enough the discharge may be observed in the air. This can be an indication of failure potential. Corona inspection is used for design, analysis, and on-going inspection. A tool to identify future failure points due to electric field caused corona nitric acid deposits, ozone aging deterioration, and deposition of airborne chemicals. Outdoor applications for corona cameras include: transmission line inspection, distribution line inspection, substation inspection, switchgear inspection, HV motor / generator winding inspection, electrical test laboratory, aerial or UAV or vehicle or hand carried, powerline inspection for damage, sources of losses, outage causes, CoroCAM is the right daylight corona camera. Indoor applications for CoronaFinder low-light corona viewers include: HV electrical test labs, switchgear inspection, HV motor / generator windings inspection, semi-conductor manufacturing... CoronaFinder is a low-light, low-cost, short-distance corona viewer with optional digital or video cameras for image storage / viewing. New CoroCAM 6D options include the Low-Light Sensitivity, the UV Sensitivity Calibration Check (set up ISO program and define "corona free level" in your specifications! ), Corona Power on-screen, and more! The CoroCAM 6D allows quantified and corona-free inspection to verify claims, see the specs in the CoroCAM 6D brochure The CoroCAM 6D now has an 18-month warranty. The CoroCAM 6N is a new low-light only high senstivity (1x10-18w/cm2 sensitivity) corona camera for laboratory use, LEDs make the best ambient light for corona inspection facilities to prevent UV snowstorms and reflections. Schedule your CoroCAM 8 demo of the new infrared, daylight corona, high resolution visible camera as shown at the IEEE-PES show in Chicago 2014. The fastest, most reliable development is happening with UViRCO Technologies. The CoroCAM 504 design has served since 2005 as the benchmark of solar-blind technology and reliable corona cameras. Contact Specialized Camera Sales at 1-800-531-6232 or (920)255-5510 or by email at cameras@maqs.net to discuss your special imaging application and bring 45 years of corona inspection experience to work for you. View More Product Announcements from OX Creek Energy Associates, Inc.